Emergency Water Storage In A Bathtub? Question: I need an emergency bathtub water bladder that I can use for emergency water storage. I was wondering if one of your collapsible tanks could be used for this purpose. I would need the tank to store 100 gallons of water. Answer: For the type of emergency water storage you have described, a Collapsible Tank could work for this purpose. These tanks feature a highly flexible design and can be placed and filled in bath tubs to store water for emergency situations. These water tanks have also been used for storage under decks, in crawl spaces, and even in basements to store needed amounts of water. Capacities include 100 gallon models, as well as almost any capacity between 1 and 250,000 gallons. The design of a collapsible tank has helped to increase flexibility and storage use for emergency situations. Collapsible tanks are designed to lie flat when empty, allowing them to be folded until their necessary storage time. Once in place, these tanks can be filled for safe water storage in their required locations. Fabrics: For drinking water, all tanks are made from an FDA and NSF 61 approved material. This allows the tanks to safely store potable water. Fittings: Fittings for a collapsible tank typically include ball valves, pressure relief vents, and caps to ensure an easy storage process. Fittings are often 3/4" through 2" in size to adapt to hoses and other filling products. Easily Moved: Tanks will typically lie completely flat when they are empty, allowing them to be easily moved to a new location. When empty, these tanks have been rolled and even folded to move to a desired location. Easily Stored: Along the same lines, these flexible tanks are also easy store. Since they can simply be folded up, they are often stored in boxes, on shelves, and in various other storage locations until the emergency need arises. High in Strength: Another advantages of these tanks is their high strength fabric exterior. 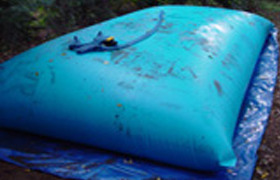 Exteriors are designed for strong and reliable water storage and have even been used in an outdoor storage location. This keeps fabrics strong, allowing them to store water on multiple level surfaces. Flexible: As a flexible tank, these tanks have often been placed inside bathtubs as well as older water cisterns. These emergency bathtub water bladder tanks act as a kind of liner that will securely and successfully store water. In addition to the emergency bathtub water bladder, we also offer a portable water bag that is ideal for emergency situations. These water bags store smaller quantities of water that can be brought with you in the event of an emergency. 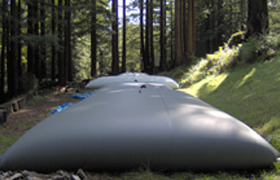 View all Collapsible Water Tank options.